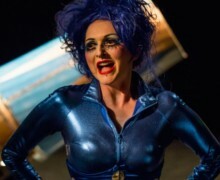 The reviews are in for Liz's Clarke's final outing of Cannonballista, the one woman show I directed last year and have been touring with since September. We're coming to Cardiff on March 8th for the last show of our mini-tour! Cannonballista in Bristol This Weekend! If you're in Bristol this Saturday night, you're in for a treat! Liz Clarke will be bringing Cannonballista, her explosive new solo show, back to the place where we made it, the wonderfully quirky, original featured, ex-working men's club, The Brunswick Club! For one night only!!! For the last 6 months I’ve been working with Liz Clarke, helping her to make her first full-length theatrical solo show, Cannonballista.